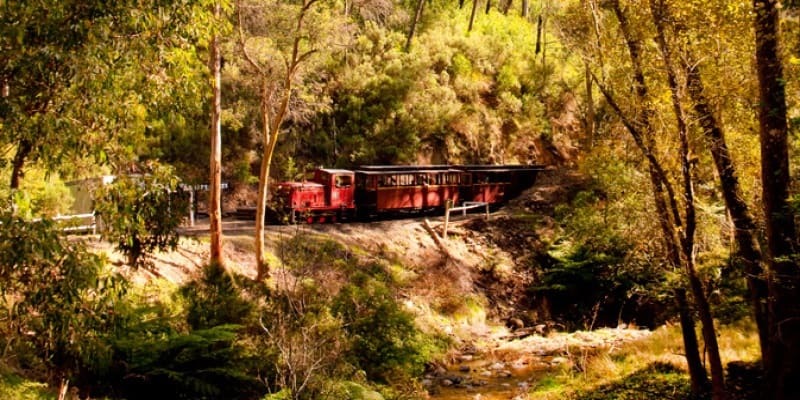 This is a delightful easy section following historic tramways linking two of the most beautiful small towns in the world. 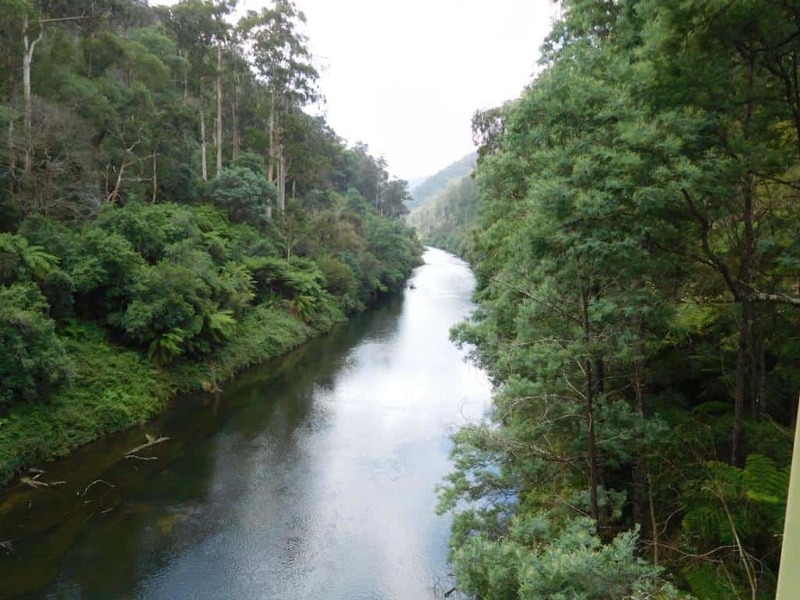 It perambulates gently through majestic mountain ash and tree fern gullies with splendid views of the awesome Thomson River. It offers numerous opportunities to sightsee, sidetrack or camp. 12 km – @ 4 hours. NB: Click on the photos to enlarge. 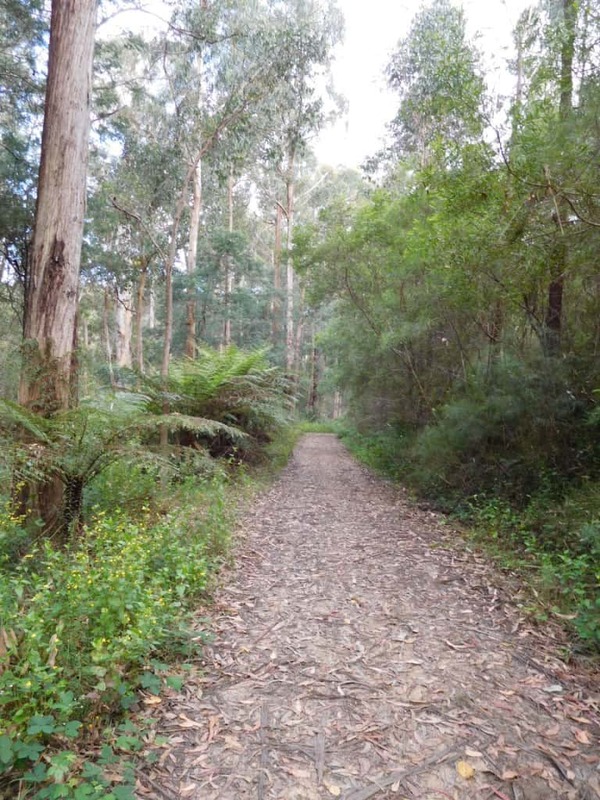 Half way (3 km) along the trail (Platina Station – shelter hut) you can turn off and drop down (2 km) to Coopers creek on the Thomson where there is a popular camp ground (toilets, water). The hotel there is now (unfortunately) closed. From Platina Station you can also take an (approx ½ hour each way) excursion to the ‘Horseshoe Tunnel’ (http://www.visitbawbaw.com.au/walking-cycling/horseshoe-bend-tunnel) a river diversion put in during the early C20th to extract gold from the stream bed (Toilets, water, camp). The whole river was intended to flow through, it thus granting access to any alluvial gold in the river bed. 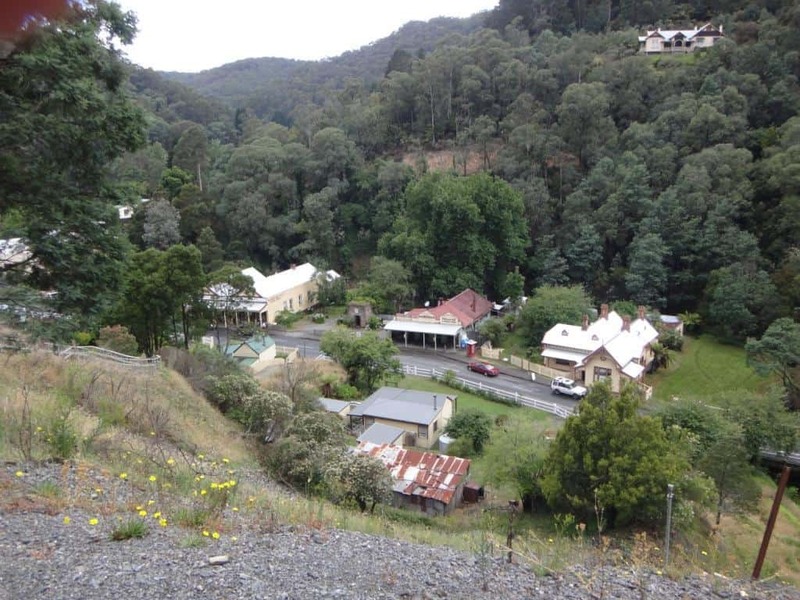 The township of Walhalla (General Store, Hotel, camp ground, accommodation, etc) is a further 1 km (15 minutes) North from the railway Station up the main street. 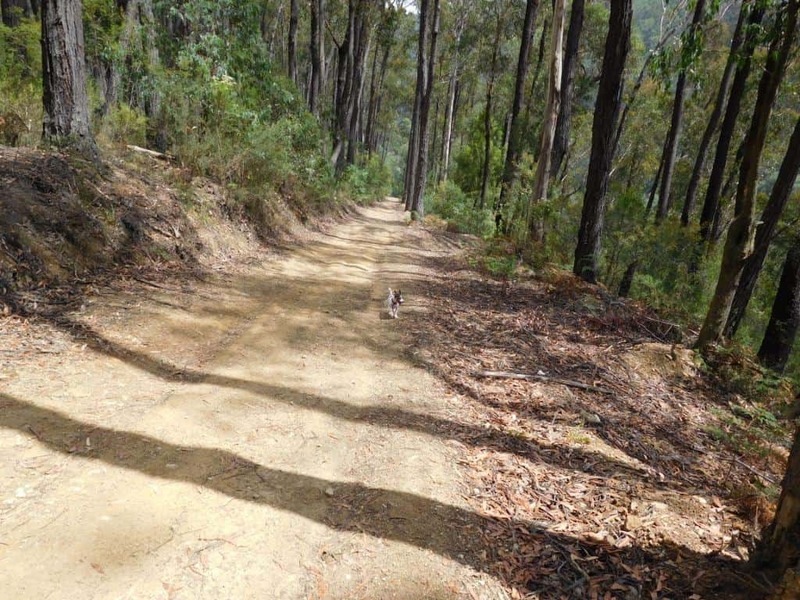 The Upper Yarra and Alpine Walking Tracks start/end opposite the General Store & Post Office where you will see a huge set of stairs ascending the mountain towards the Long Tunnel Mine. 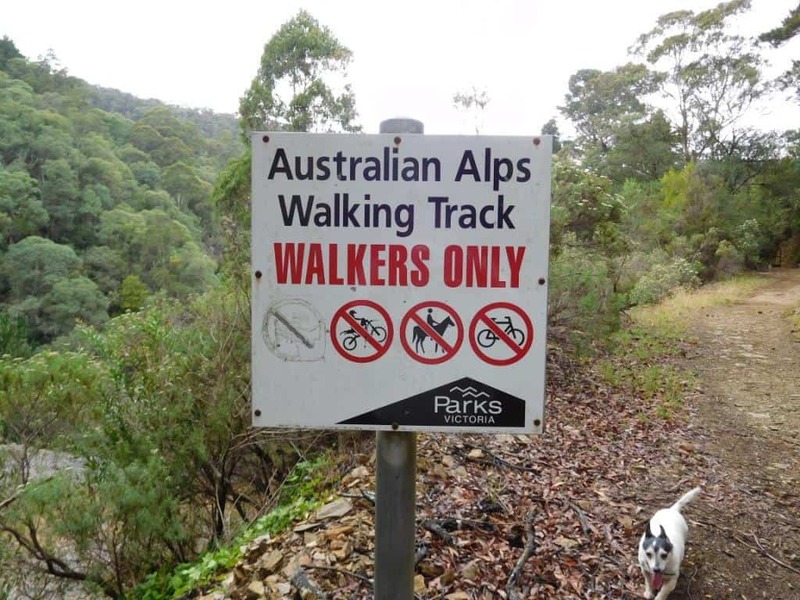 The tracks are not signposted at the main road (mysteriously) but there are signs about 100 metres up the hill, though none mention the Upper Yarra Track! Walhalla seems to be suffering from a fit of amnesia regarding this iconic track, so important to its existence for so long! 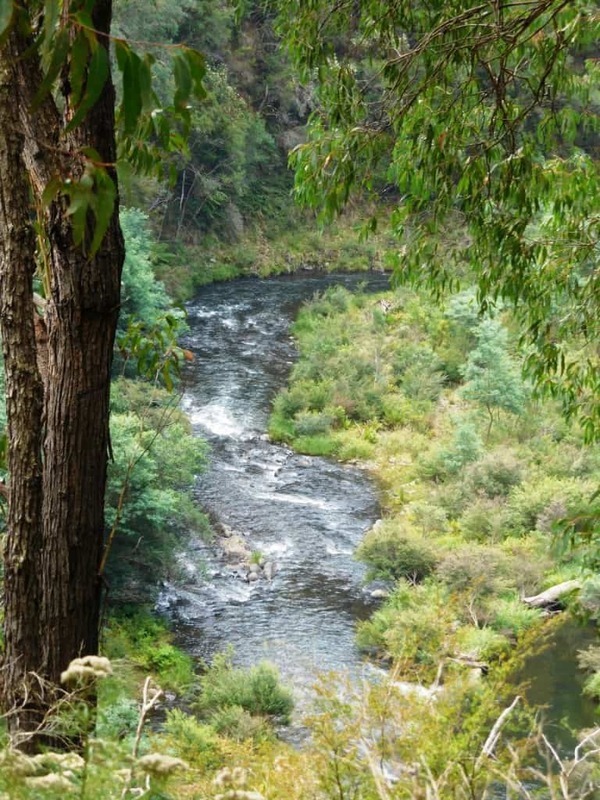 There is plenty to see and explore in and around Walhalla. You may want to spend a few days thereabouts. 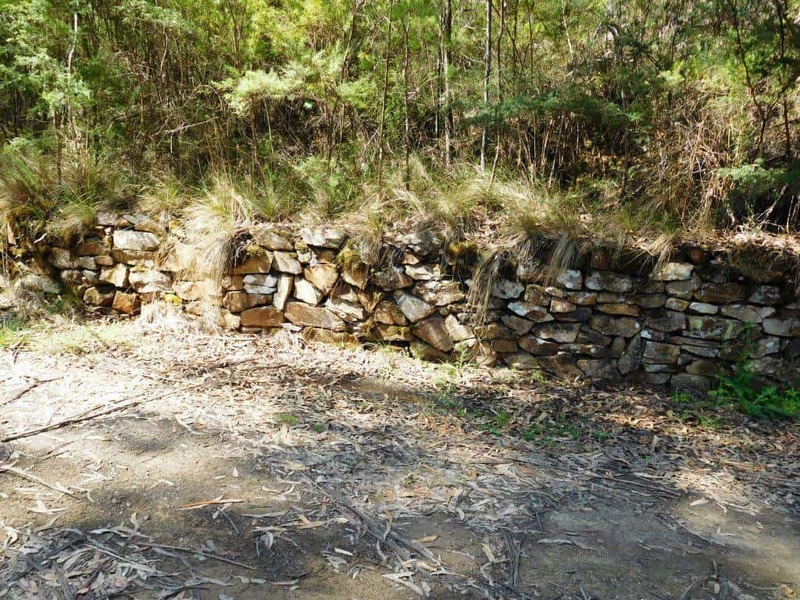 If you have never been there before you are going to be astonished by the beauty (and history) of this quaint old gold mining town nestled in the deep valley of Stringers Creek. Take a look at the cemetery and cricket ground. Maybe do a tour of the Long Tunnel mine. Most of the buildings are authentic mid C19th. Heading out of Walhalla you can divert via Rawson to pick up additional supplies if needed before you tackle the beautiful and awesome Baw Baw Plateau. For example, a side trip via Happy-Go-Lucky to Bruntons Bridge (water, toilets camps) is highly recommended. 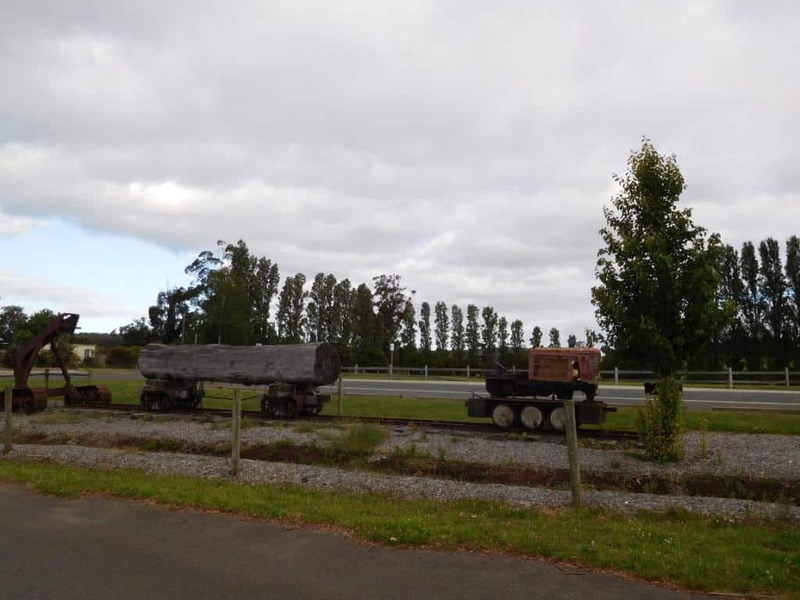 The trail begins just as you enter Erica on the East side of the road opposite the hotel next to a shelter, convenience stop and caravan park and these mementoes of the region’s logging history. 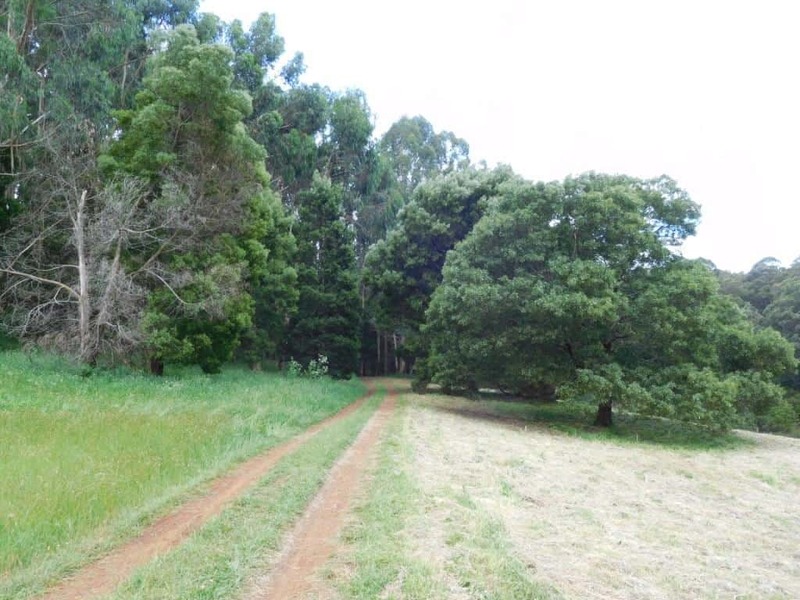 Right on the outskirts of Erica the trail plunges from lush green paddocks replete with fat kine into the enfolding forest. Minutes out of Erica a lovely dam makes for a refreshing rest stop. 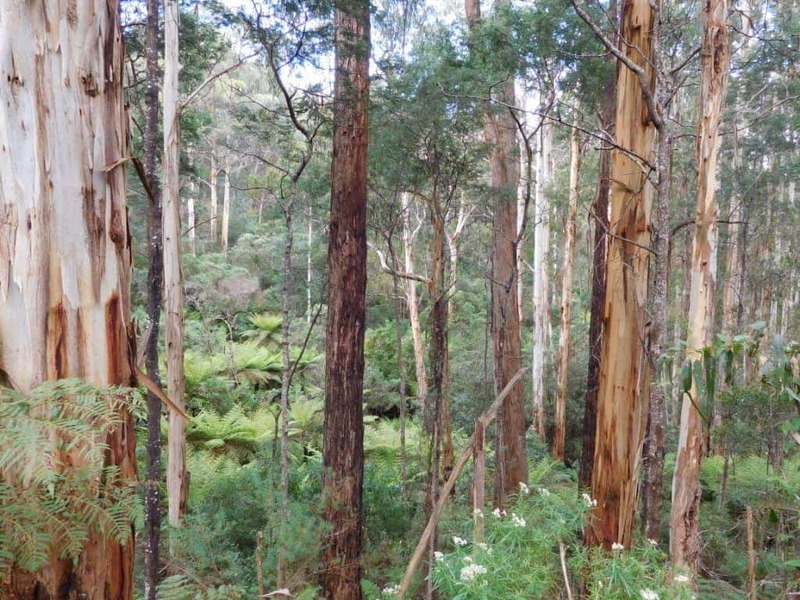 Straightaway you plunge into magnificent mountain ash country: this species is the tallest tree/plant in the world. 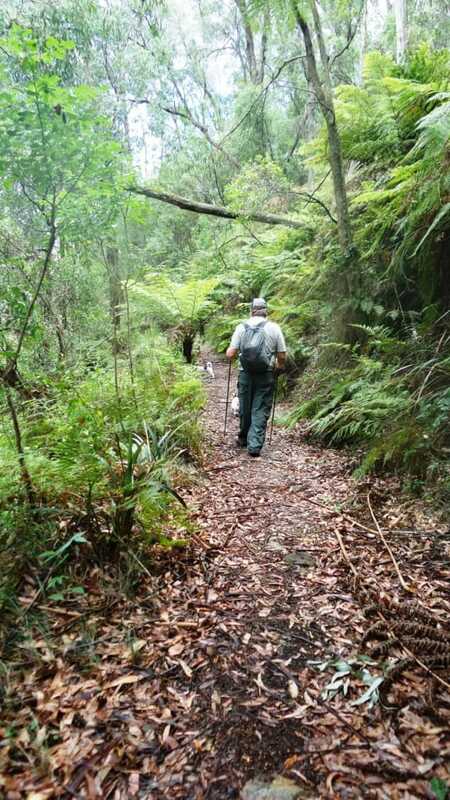 The trail is in wonderful condition. As always the Jack Russels Spot and Tiny lead the way. 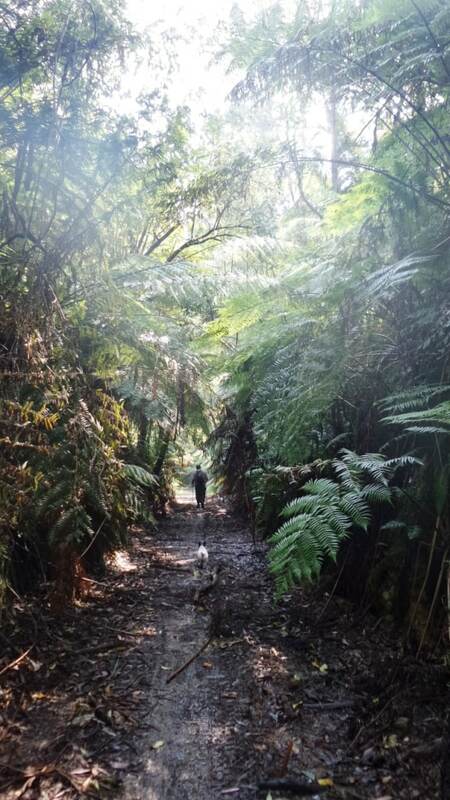 Through beautiful tree fern tunnels. 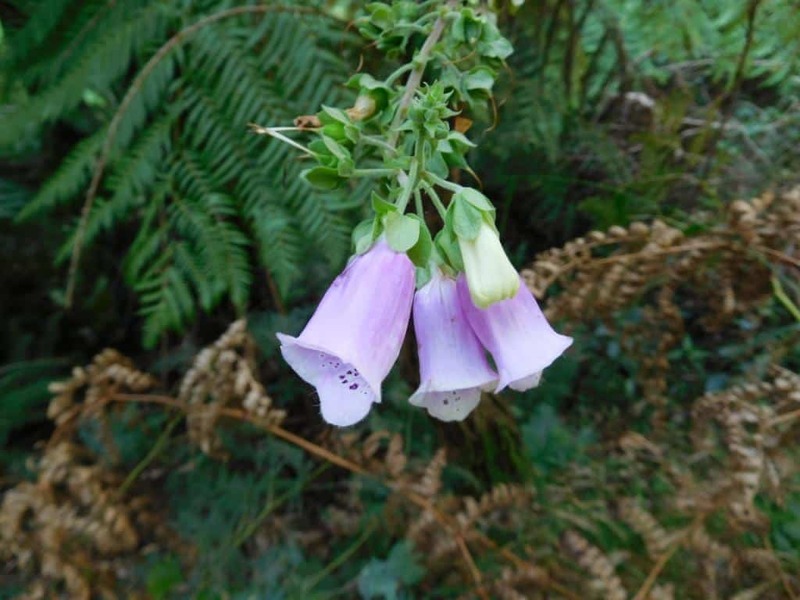 Along the way a very late summer foxglove in a shady nook is a touching reminder of the C19th goldfields women who followed their menfolk to the ends of the earth. 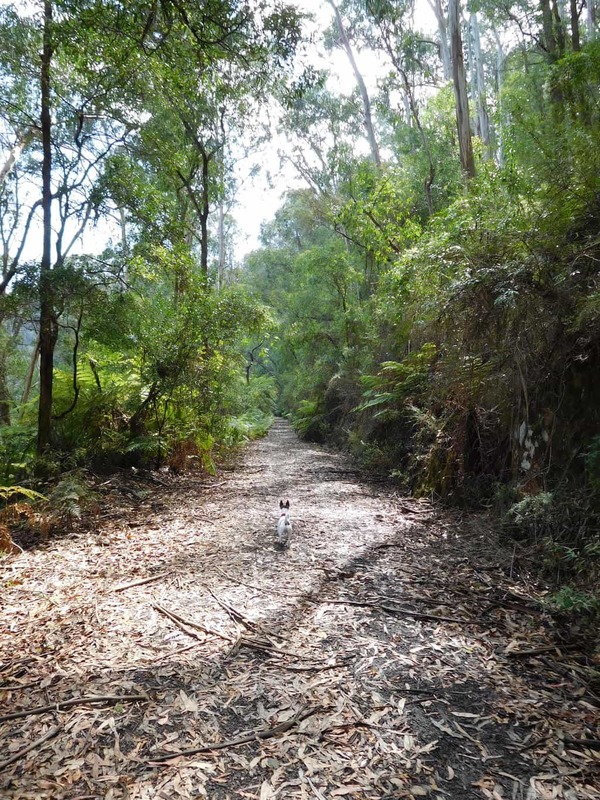 After about 40 minutes the track crosses the Tyers-Rawson Rd to this information point, formally Knotts Siding. Once again you are plunged into magnificent ash and tree fern. As we were walking this section we heard a sound like a cannonade as one of these giants crashed unexpectedly to the ground. This happens often over summer. 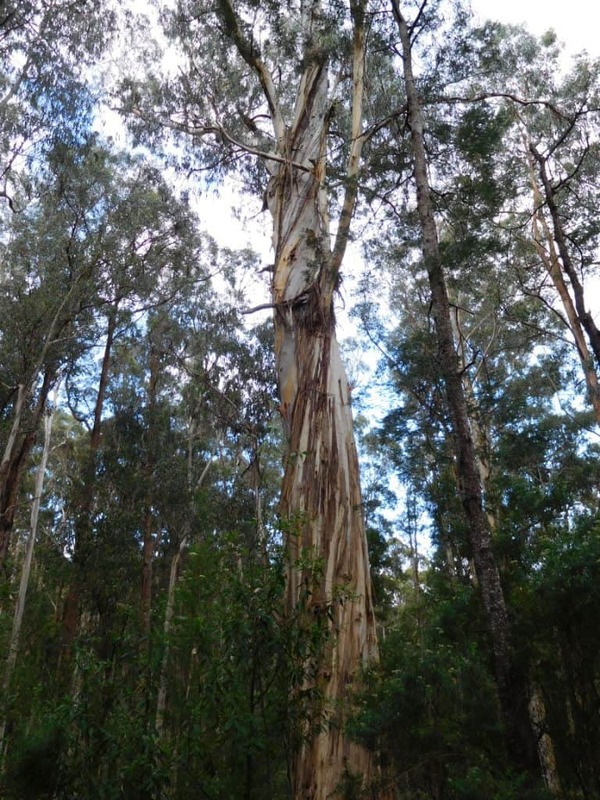 Gums are ‘self-pruning’ – a dangerous habit should you be foolish enough to camp underneath one! The track is wide enough most of its length that two can walk abreast. 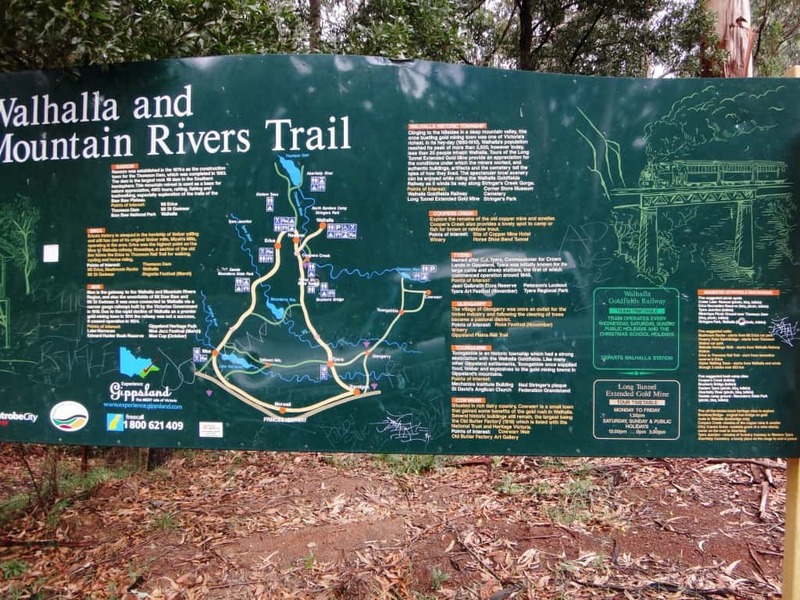 After Micah Creek (water, camp) Platina Station marks the turn off for Coopers Creek campground a couple of kilometres away and/or the Horseshoe Tunnel. The Horseshoe Tunnel diversion track below: as you can see an easy portage if you are packrafting the Thomson. 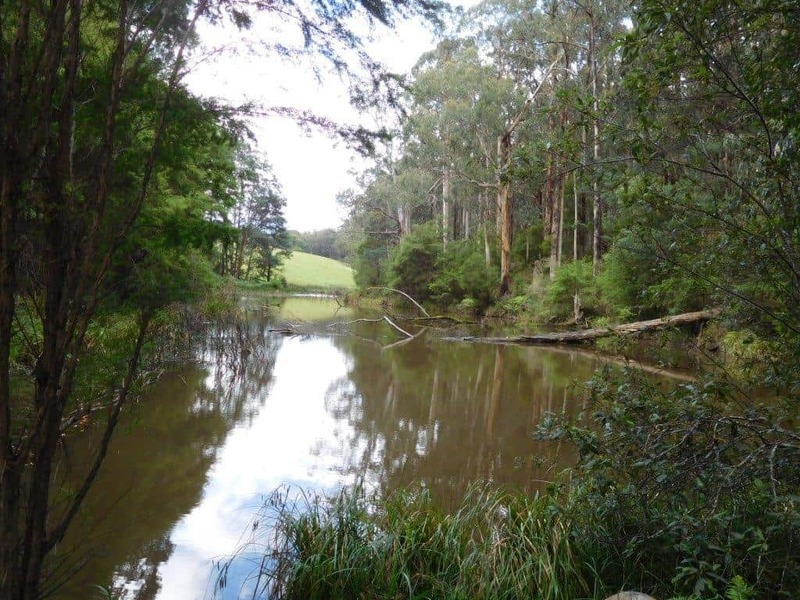 There are many glimpses of the mighty Thomson River through a screen of trees. It is a lovely wide well-graded track: easy walking. Spot, as usual is out in front. 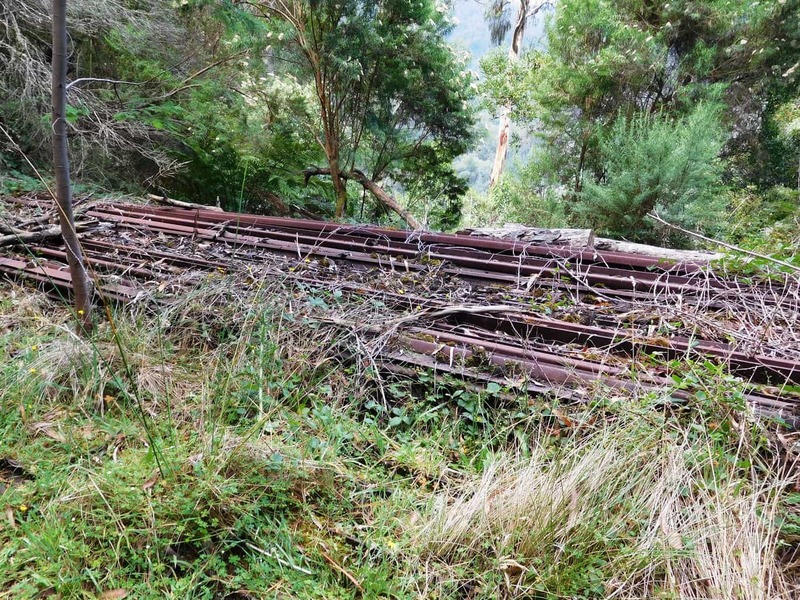 Many mementoes of the old Moe-Walhalla line along the way. 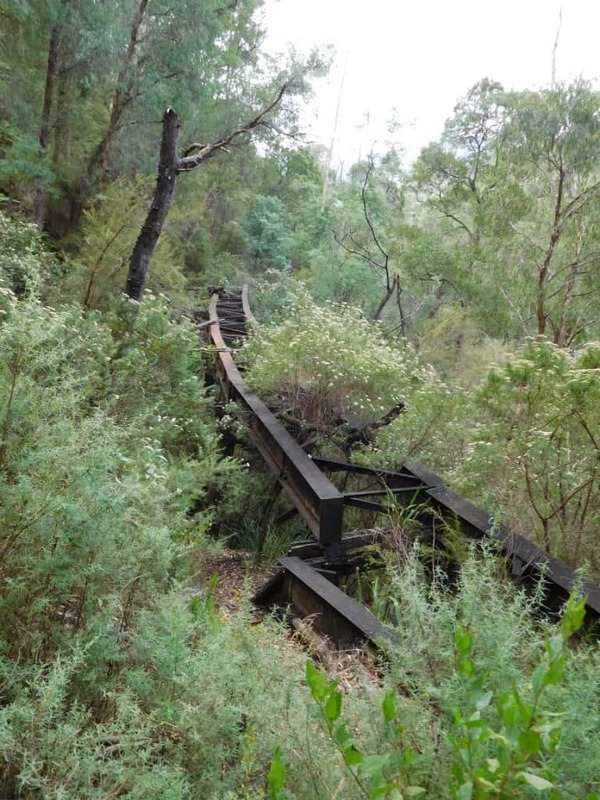 A fallen bridge. 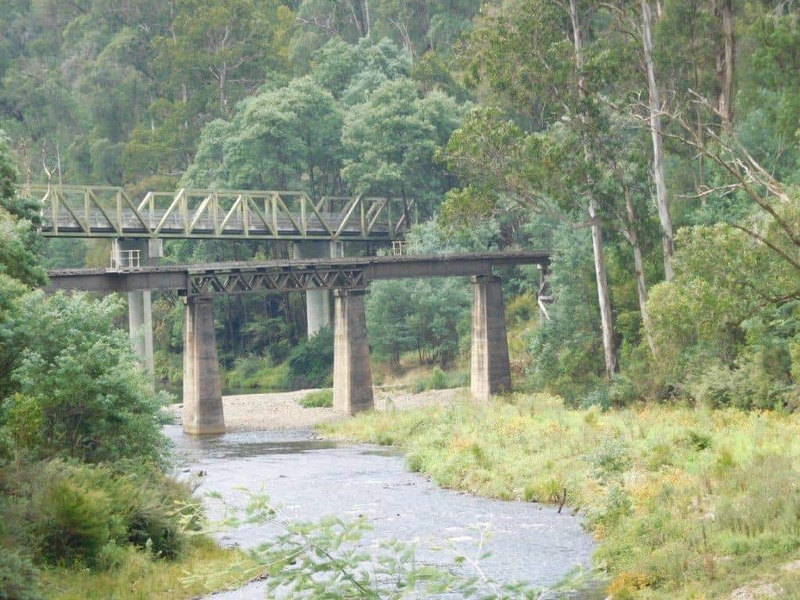 Road and rail bridges span the river at Thomson Station. You can see from their height how far this river can rise. 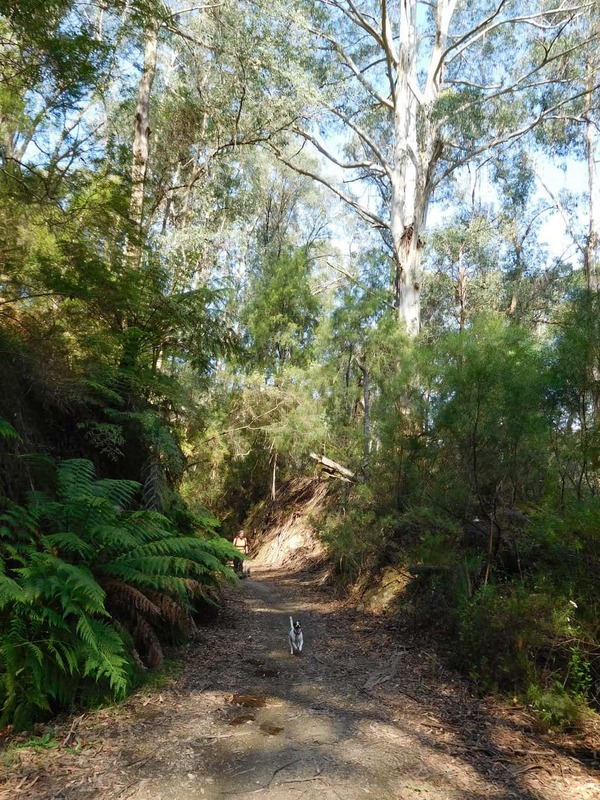 After crossing the Thomson, the Mormon Town track on a dry ridge marks a change in vegetation to peppermint gums. 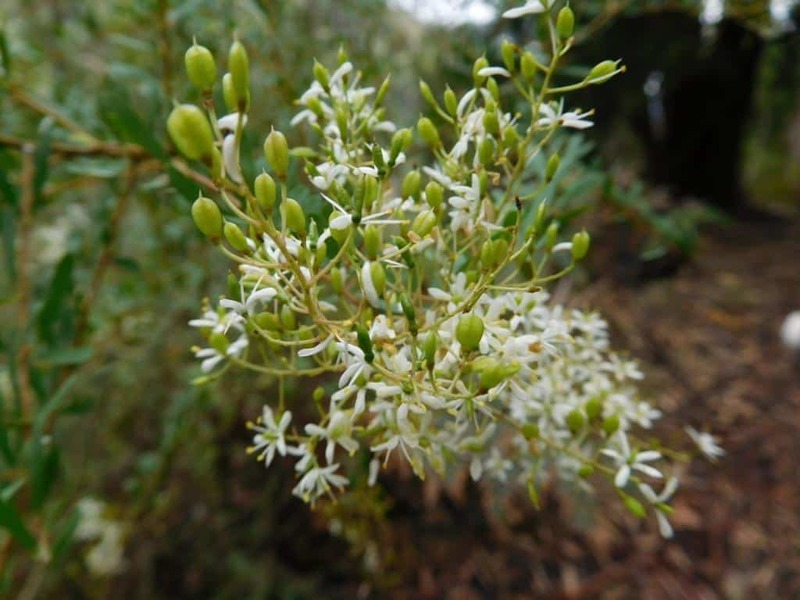 The Australian bush is always a riot of wildlowers. Indeed very few places offer the bewildering array of species you find all about you here. 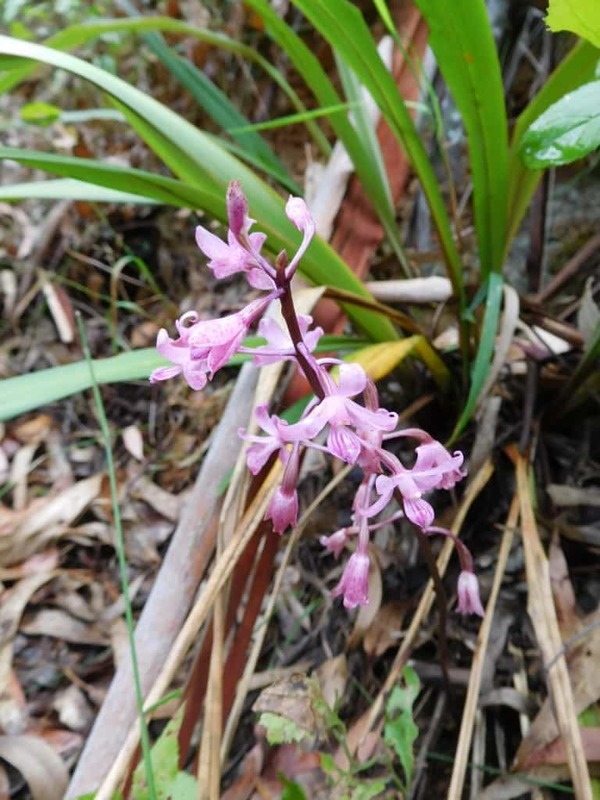 Native trigger flower: a carnivorous variety. This is a wild cherry. 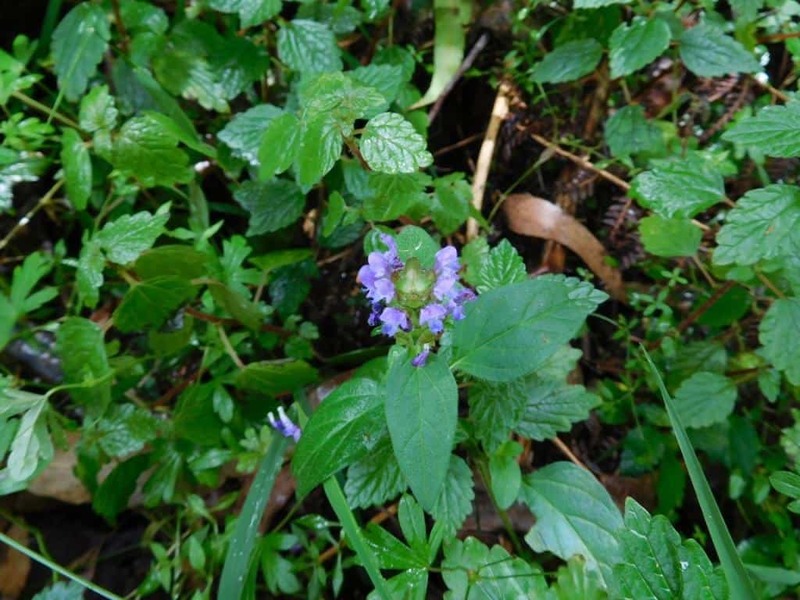 It is a parasitic plant with an edible fruit (hence the name). It is only one of two trees in the world which bears its nuts outside its fruit (hence ‘exocarpus’), the other being the pecan. The Poverty Point tramline was in many places hacked out of a near vertical hillside. The main road is about fifty metres below – straight down! 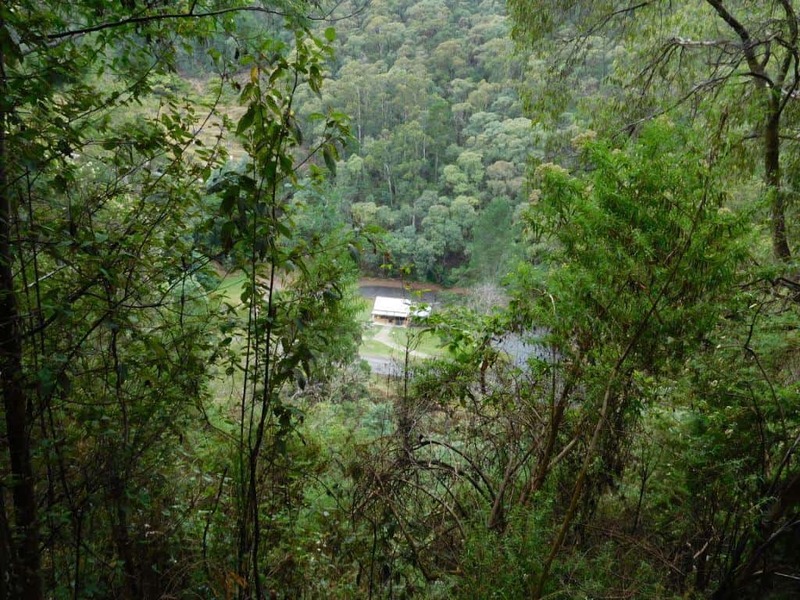 Early glimpses of Walhalla through the trees: below the new ‘Visitor’s Centre’. 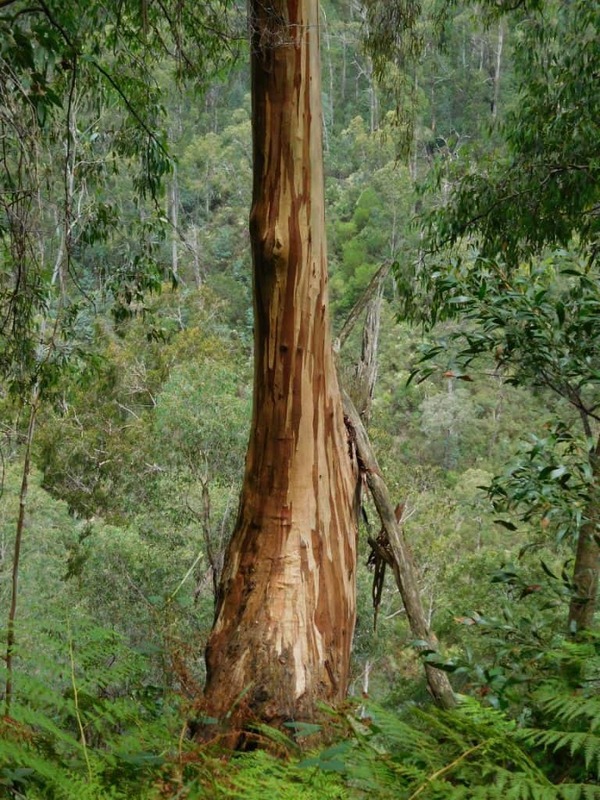 Early settlers could not quite believe Australian Eucalypts, a dominant genera in today’s landscape as they kept their leaves whilst shedding their bark. Another annoying habit they have is turning their leaves to avoid the sun, thus casting little shade on a hot day. There are some majestic examples in the wetter gullies. 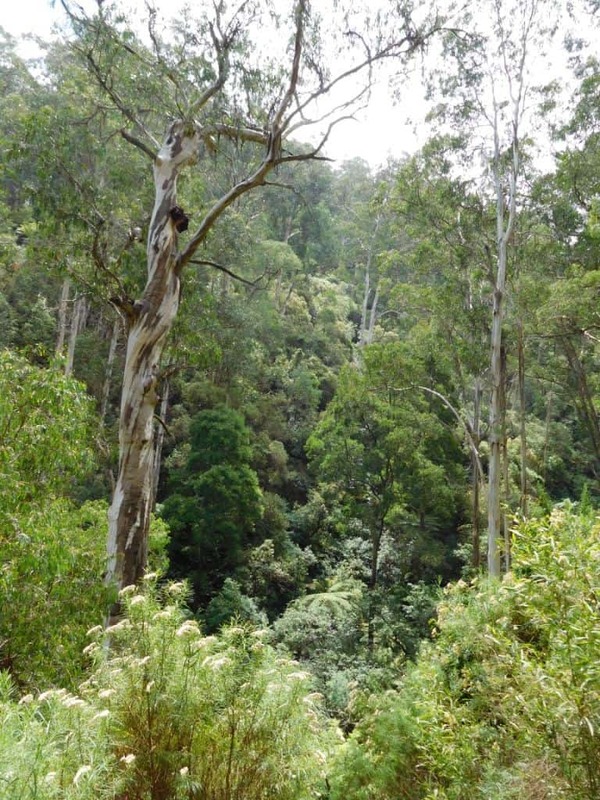 Hard to believe that a hundred years ago there was not s single tree growing within thirty kilometres of Walhalla – so great was its voracious appetite for wood! They are quite quick growing. Trees which sprang up from seeds after the 1939 fires had trunks which made a single semi-trailer load a mere fifty years later. 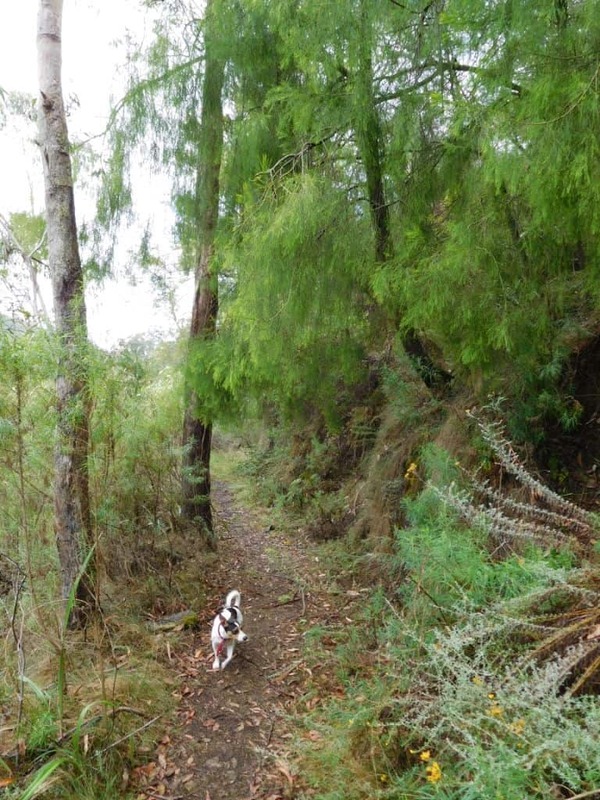 Spot really enjoys a walk. He is way ahead of Della here. 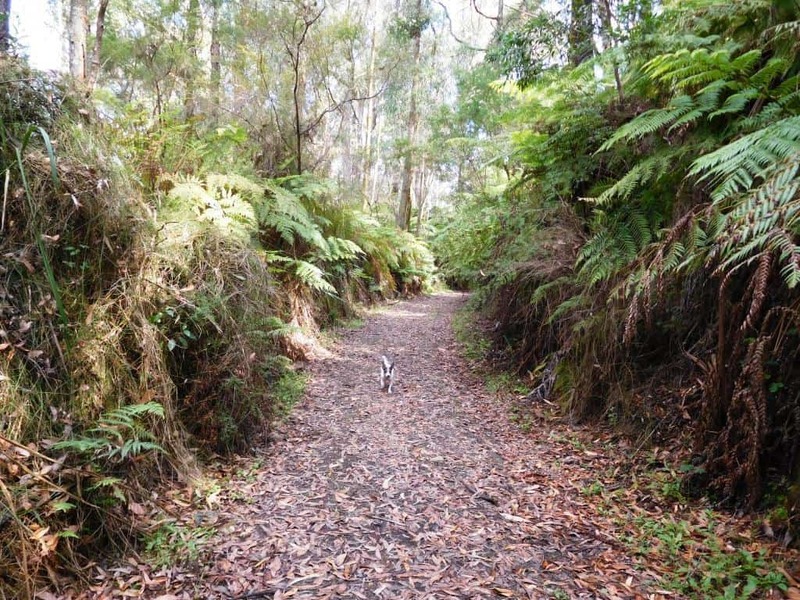 The road goes ever on and on…That is bark on the track, though we did see a small snake and a water dragon at the river crossing – and at least fifty species of birds! Someone had removed one of the forbidden things on the sign. Tiny cannot believe it was ‘dogs’. 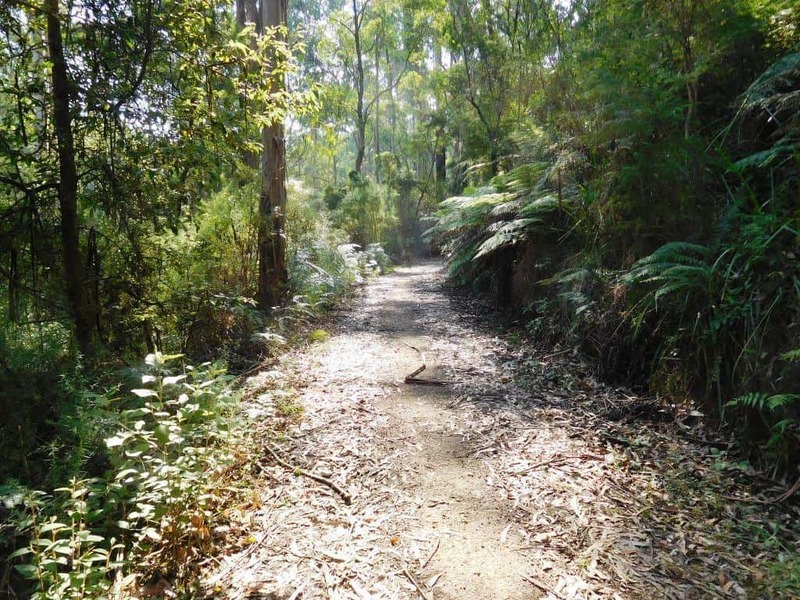 We saw indications that both horses and pushbikes have also ‘strayed’ onto this lovely track. Someday no doubt such misdeeds will be a capital offence! Or forgotten quite. 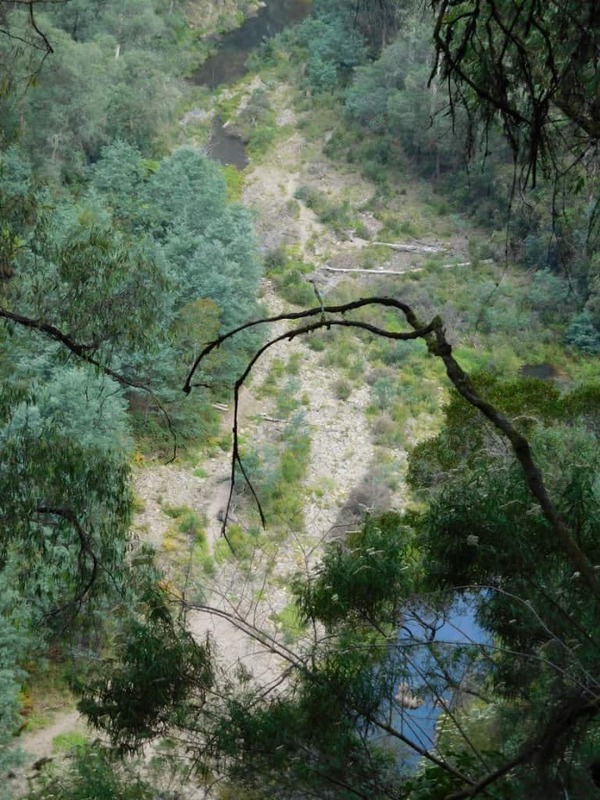 At trail’s end Walhalla lies nestled in the valley of Stringers Creek. The General Store is centre; the old Post Office on the right. 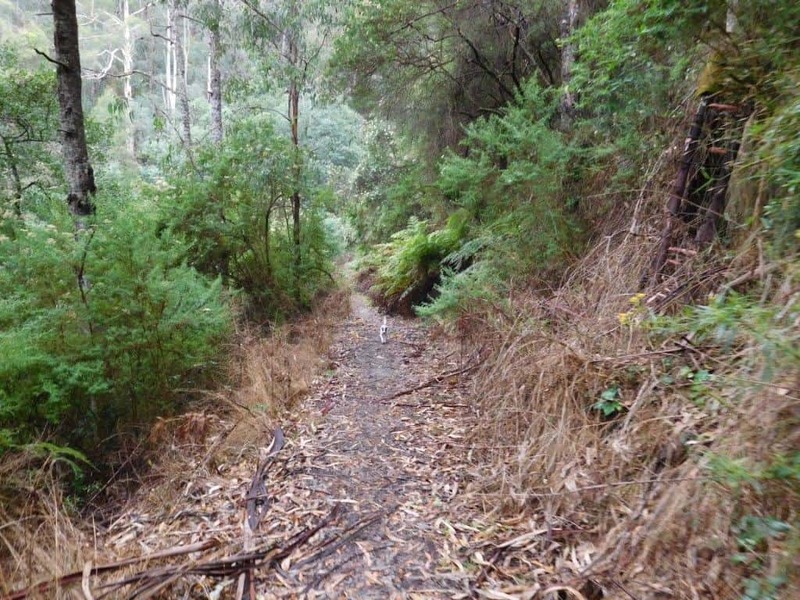 The staircase on the far left marks the beginning/end of the trail.